Chile is the most seismic country in the world. In some places, such as La Ligua, the earth trembles almost daily. On average, inhabitants of the region will experience some hundred temblores (quakes, light ground motion), and at the most two terremotos (earthquakes) in their lifetime. The third toponymic journal is devoted to the entire spectrum of expression of seismic mediums. 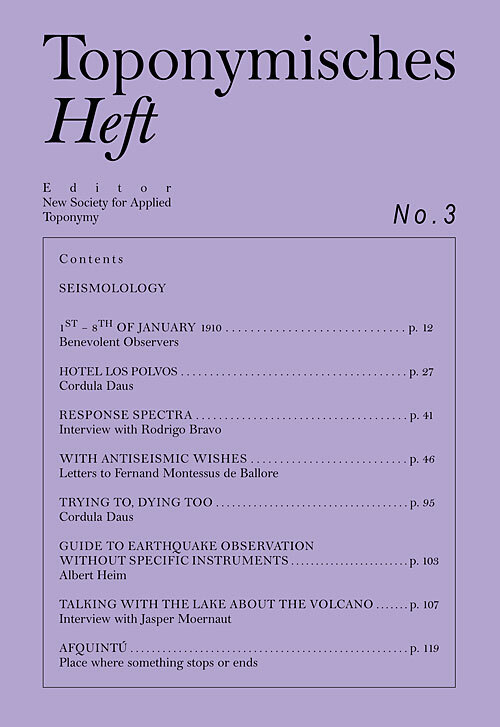 It features contributions to a study of tremors (Erschütterungskunde) recalling its own significance. Benevolent observers, a magic index finger, seabed sediments and hotel walls tell of an almost forgotten experiment: when does an event begin; can it be felt? How can we write without being moved too much? Can geology save us from sentiment? 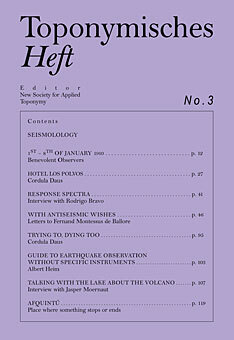 Toponymisches Heft is a journal series focusing on problems of naming, of wording the world. Issue No. 3 features a collection of first published letters to the French seismologist Montessus de Ballore, instructions for earthquake observation and raw ceramics works, as well as interviews and narratives.